The University of Pittsburgh/UPMC Department of Surgery is one of the leading surgical programs in the country, offering innovative surgical procedures, state-of-the-art technology, and high-quality patient care. Our surgeons pioneer and refine surgical procedures to provide leading-edge, compassionate care to patients who require surgical services in a wide range of specialties. 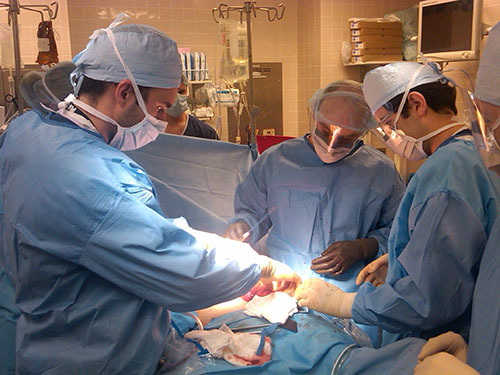 Through the University of Pittsburgh/UPMC Department of Surgery, patients have access to advanced procedures and technological innovations, from specialized care for liver cancer and a ground-breaking method of delivering chemotherapy at UPMC Passavant, to a new state-of-the-art operating room with integrated imaging technology at UPMC Presbyterian. UPMC’s breadth of surgical capabilities ensures that patients receive world-class care whether they are cared for at the flagship hospitals in Oakland and Shadyside or at one of UPMC’s community hospitals or surgery centers. Encompassing six University of Pittsburgh health science schools and a host of affiliated hospitals, clinical facilities, and specialized centers, UPMC has developed cutting-edge medical programs and has recruited some of the nation’s most talented surgeons. At the University of Pittsburgh/UPMC Department of Surgery, the surgical leaders of today train the surgical leaders of tomorrow with exceptional research and training opportunities in every area of clinical surgery. For more clinical information about the department, please visit our clinical website. It is my pleasure to welcome you to the website of the Department of Surgery at the University of Pittsburgh. We take pride in the excellence of the clinical care we provide and the strength of our research and educational programs. Our threefold mission focuses on providing the best possible patient care and educationa and research programs. Our faculty are affiliated with the numerous renowned research and clinical centers of excellence. Our faculty have won some of the most prestigous awards in the nation for research and science in the field of surgery. Our faculty members have authored renowned textbooks in academic and clinical surgery. Our general surgery residents gain valuable experience presenting at international, national, and regional conferences and have won many distinguished awards. The University of Pittsburgh School of Medicine is committed to diversity and inclusion. The Department of Surgery is proud to be an institutional member of several academic organizations and events.